Home » Posts Tagged "genetics"
Another entry in the Woven Together series talking about the fascinating development of a little person. This series deviates from the main content of the blog – how things go wrong – to tell how things go right. I hope you enjoy! Meiosis. This word probably conjures up memories of high school biology class where you had to memorize a lot of meaningless terms, but today I want to show you how it is a romantic word. Yes, you read that right. A couple comes together pretty intimately in the body of their child. She has Mom’s nose and Dad’s eyes, Mom’s chin and Dad’s smile. But meiosis allows the couple to come even closer in the cells of their grandchildren. Let’s dive in! And now for the exciting conclusion to these two posts. Disclaimer: I’m not a doctor – just a bioengineer who happens to find pathophysiology fascinating. If you find an error, please let me know! Also, NONE of my drawings are to scale. In this post, we looked at how one tiny change in a person’s DNA caused her to suffer from sickle cell anemia. We learned that, untreated, about 50% of children with sickle cell anemia die before their fifth birthday. If you understand natural selection, you’ll recognize this as a puzzle: if sickle cell anemia is so deadly, why are there so many people still affected by it? Let me explain the puzzle a little further. For almost all traits, a person has two copies of instructions: one from her father and one from her mother. Sickle cell disease is autosomal recessive – which just means that both parents must pass on the sickle cell trait for the child to be sick. People who only received the trait from one parent aren’t sick, but can pass the disease on to their children. 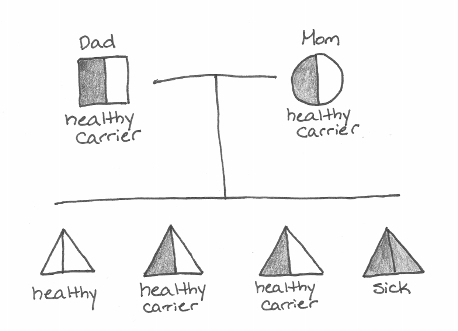 In this case, Mom and Dad are both carriers of a genetic disease. Statistically, 1/4 of their children will be completely healthy, 1/2 of their children will be healthy carriers of the disease, and 1/4 of their children will be sick. In most cases where an autosomal recessive trait is deadly early in childhood, the disease dies out. A child affected by the disease won’t live to have children of his own, and thus won’t pass down the bad information. With no one to pass it on, the disease stops. But, sickle cell disease hasn’t followed that pattern. Today, we’ll be learning about sickle cell anemia. Disclaimer: I’m not a doctor – just a bioengineer who happens to find pathophysiology fascinating. If you find an error, please let me know! Als0, NONE of my drawings are to scale. Sickle cell anemia is the ultimate morality tale about the importance of the little guy: in the 3 billion letters that make up your genome, one letter determines if you’re healthy or sick. Inheriting the wrong gene for hemoglobin can cause extremely painful episodes, recurring infections, and even death. Let’s see how it happens. It all starts with what scientists like to call the Central Dogma of Biology. It says that information comes from your DNA, gets translated into amino acids, which get strung together to form proteins. DNA is the instructions, amino acids are like LEGOs, and the proteins are like the resulting LEGO dinosaur. The central dogma of biology: DNA provides the instructions for the order of amino acids (LEGOs), which fold to create a protein (or dinosaur). You wouldn't want to miss a post, would you? Copyright © 2013-2016 PathologyStorybook.com. All Rights Reserved.